Too many Christians miss the idea that calling is for them. They spend their entire lives longing for the abundant living that comes from being centered squarely in the sweet spot of one’s unique personal calling and design. They live with a tension or holy discontent, sensing that God has something more for them than what they currently are experiencing. The introduction offers hope that each of us can find our unique sweet spot of personal design and live meaningful lives of purpose. The pathway to our unique personal calling is an entrepreneurial journey that requires us to see today as a snapshot of the bigger story God is writing in our lives. We must recognize that the events of our lives, good and bad, form the path to discover our unique sweetspot of personal calling. God is at work both upstream and downstream in our lives, and the clues to our unique calling are there for the finding. The journey to clarity of calling often travels through the fog of confusion. Some fog is internal and within our control while some is external and beyond our control. We must learn to discern the difference, eliminate that which we can control, and embrace the rest. God often uses the fog to build our faith and give us the clarity we need at just the right time. We are created for eternity, and we can only find meaning and significance with a proper understanding of who we are made to be. Our deepest longings for more are normal, and rooted in God’s desire for us to be restored to the relationship we were designed for with him. We are separated from God and eternity due to sin, yet our deepest longings cry out for significance, impact, legacy and immortality. Too many of us become captive to the tangible “rate race” of the world and miss the abundant life that is available to us. That rat race for more hijacks God’s divine plans for us and keeps us from experiencing the sweet spot of our personal calling. God saves each of us from our self by bringing us into a restored relationship with him and a proper identity of ourselves. We surrender the “lordship of me” to the Lordship of Jesus. It’s only in the context of this restored relationship that we can find our true identity and unique personal calling. He calls us by name to experience a more abundant life. Here the reader will discover why we are given a unique sweet spot of personal calling. God does not give us a unique calling for our own purposes; he equips us to be part of something much larger…a people called to be the fullness of Jesus in every corner of society. God equips us with unique gifting to accomplish the purposes he has for us. Our uniqueness is a gift of equipping from Jesus that is not to be delegated to others. We are responsible for discovering and fully deploying the special gifts he’s given us. Our personal calling is a proxy directly from Jesus to serve him, and to carry his love into the world. Engaged personal proxy + compelling causes = world changing impact! We all need a guide to walk with us and empower us as we pursue our sweet spot of personal calling and as we take the fullness of Jesus into every corner of society. God has given us the perfect guide in the Holy Spirit. He has the power to fill every crack and cranny of society, and he knows every intricate detail of our lives and was actively involved when our unique sweet spot of design was created. What better guide into discovery could we ask for? Our unique sweet spot of personal calling can be discovered by discerning who we were created to be (our unique design), what we were made to do (our unique purpose and good works) and where we are to go (our unique positioning). The alignment of this “Be-Do-Go” context forms the foundation of the sweet spot framework used throughout the book. This chapter presents the model and begins the process of applying it. This chapter gives a framework for understanding calling. It starts by separating calling into two parts: General calling is the dimension of calling that we share with all Christians, everywhere, at all times. We are to be disciples (BE), who make disciples (DO), where we are (GO). Personal calling is the dimension of calling that is unique to each person. We are uniquely made (BE), to do good works (DO), where we can be most effective (GO). Our primary or general calling is discovered in being disciples of Jesus (fullness of Jesus in us), who make disciples (fullness of Jesus through us) where we are. This is true of all Christians, everywhere, at all times. Our secondary or unique personal calling is discovered where God’s unique design in our lives overflows to specific good works and deeds, where ever we can be most effective. This chapter focuses on the “doing” element of personal calling– what are we uniquely made to do? All Christians are called to make disciples, and we each have a unique set of good works and deeds designed for us to accomplish. This design for action fuels our efforts to be the fullness of Jesus into all corners of society. The fruit of putting Jesus at the center of our lives, with a priority on making disciples, will overflow into putting love into action wherever we go. 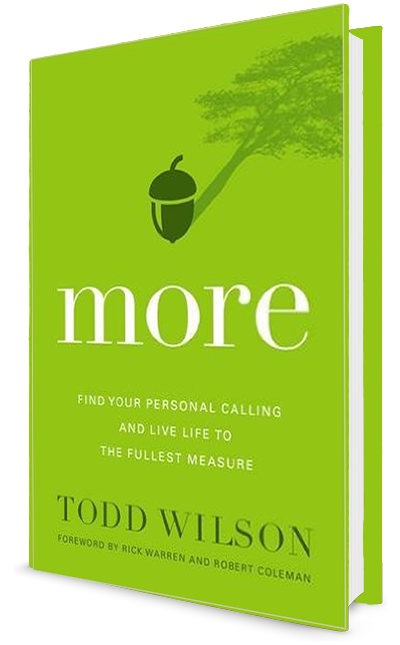 This chapter focuses on the “going” element of personal calling– where are we to do what we are called to do? All Christians are called to be disciples, who make disciples, where they are. Too often we miss the opportunities right in our own backyards as we dream of more compelling adventures in other places. In being good stewards where we are and with what’s been entrusted to our care, God reveals the unique places we are to go. Covers the first unique element of personal calling. We are each unique with characteristics that are embedded in who we are created to be. These characteristics transcend and show themselves across all domains of life and are like the basic ingredients of a recipe for an award winning dish. Covers the second unique element of personal calling. Ephesians 2:10 says we were made for specific good works and deeds. Our unique gifts, our passions and our burdens shape and inform what we were made to do. The story God’s already written in our lives provides insights into what we were divinely made to do. Covers the third element of personal calling. This element of personal calling is about “where” we are to be positioned to most effectively use our unique gifts, good works and deeds. This chapter looks at how we can best discern our compatibility for specific roles and positions. Elements include our personal values, roles and life rhythms. Everyone needs people who say, “You can do it!” and can speak candidly into our story. Don’t try the journey of discovering and engaging your personal calling alone. This chapter highlights the importance of inviting others into our story to provide us permission, encouragement and accountability. Just as others come alongside to encourage us, we should do the same for others. We are just the right person, at just the right time, in just the right place to speak into the story God is writing in other’s lives. This final chapter seeks to tie together the key truths, learnings and discoveries from the book with concrete WINs (What’s Important Now) to accomplish. The reader is encouraged to complete a draft or initial version of the sweet spot resource card, highlighting their unique elements of “Be-Do–Go.” The reader is challenged to continue the journey of discovery and is provided suggested next steps that will help create momentum beyond the reading of the book.